In 1915, an Armenian family falls victim to systematic deportations that led to the Armenian genocide under Ottoman rule: Nazaret (Tahar Rahim), a blacksmith, is separated from his wife and children and taken to a labor camp in the desert. After he survives an ensuing execution attempt, the blacksmith, now mute due to a sword slash near his gorge, sets out to retrieve his family members. From there on, Fatih Akin’s The Cut depicts a lengthy and unrewarding odyssey during which audience and protagonist must face drawback after drawback in a plainly-structured universe: every time we hear good news about Nazaret’s daughters – that they are still alive, did not become prostitutes, did indeed pass by this particular location etc. -, bad tidings are sure to follow. This carrot and stick attitude soon becomes predictable, annulling any moderating intent. Cutout characters and Nazaret’s unlikely fortune – he chances upon his ex-apprentice in Aleppo and upon his half-dead sister-in-law in a hopelessly overcrowded refugee camp – add up to the viewer’s dissatisfaction with a film which is too unrealistic in substance to communicate historical trustworthiness, and too realist in spirit to come off as lyrical. Though it again depicts the fringes of society, where most of Akin’s earlier work took place, The Cut is a film of superlatives in every other respect. Logistically, it is his most costly and ambitious project to date – 7 countries made the production credits, with the story set in awesome locations in cities as diverse as Aleppo, Havana and Michigan. 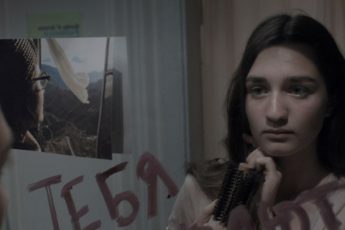 Consequently, the genocide and Nazaret’s Armenian roots often recede beyond view, muffling the film’s call for humanism. The otherwise cliché-riddled film doesn’t truly attempt to sketch an even general idea of Armenian culture. Nazaret – renouncing his religion early into the film, and speechless – is of little help. The main aspect of Armenian identity that Akin forcefully captures thus becomes the life in exile that some were able to choose over certain death. Akin made his debut feature Short Sharp Shock – a graphic low-budget experiment with occasional moments of sentimentality – when he was 24. Lauded by critics, the 1998 film was seen as a promising new start for German-Turkish cinema, though it also resonates with other European auteurs’ debuts from the time (e.g. Gaspar Noé’s I Stand Alone, 1998; Krzysztof Krauze’s The Debt, 1999). His later features take up where Short Sharp Shock left off, joining anti-establishment messages and sexual/violent ventures with genre clichés. In some cases, notably Soul Kitchen (2009), the result is downright generic, though Akin usually manages to keep the audience under his spell through multicultural liveliness and likeable characters. The Cut, then, is no sudden concession to the mainstream public, which Akin always cared about, but a renunciation of his directorial trademark in favor of an obsolete form of classical cinema. The Cut shows nothing of Akin’s provocative questioning of normalcy and conformism on either an aesthetic or an ideological level; cross-cultural parallels and differences are explored but on the surface, appealing only to those who commit to cosmopolitanism anyway. Germany, which provided the lion’s share of funding and is home to Akin, saw mixed reactions in the domestic press. While some reviewers voiced contentment (e.g. Der Spiegel, Süddeutsche Zeitung, Tagesspiegel), those who didn’t gave widely dissimilar rationalizations for their negative verdicts. Where one share of critical reviewers argued that the film’s laudable agenda is not matched by an appropriate form (e.g. taz), another arrived at an opposing upshot: Robert Best (junge Welt) found The Cut to be interesting to watch, but overly moralistic. Yet others were disappointed by both form and message: Peter Körte (Frankfurter Allgemeine Zeitung) and Susanne Oswald (Neue Zürcher Zeitung) go as far as to dispute the film’s addressing the Armenian genocide. Interestingly, those reviewers writing for conservative papers – notably Körte and Oswald – were generally harsher towards Akin than moderate/liberal or left-wing critics, who either liked certain aspects of the film or the product in toto. By offering diametrical analyses regardless, the latter give the impression of wanting to reward Akin for his ideological effort at all costs; Körte and Oswald in turn appear to warrant their loud misgivings by claiming that Akin is not really dealing with the Armenian genocide. This repertory suggests that in order to criticize a film dealing with a genocide, one must first prove that it does not really deal with that crime at all or else confine one’s critique to certain aspects of the work. The picture is telling both with regard to our perverse understanding of political correctness and the film’s nature. To speak about The Cut is to speak about the Armenian genocide – not because that event is forcefully portrayed by the director or because it will haunt audiences, but because the film’s aesthetics are only justifiable (and bearable) relative to a specific, political context in which historical facts are systematically disallowed. To those not having fallen prey to Turkey’s nationalistic propagandists (e.g. virtually all Armenians), the film offers little besides a vague, emotional backdrop to the events in 1915. Meanwhile, gainsayers – if they go to see the film at all – will find plenty of space for elaborating their narrative: prevalent minimizations (e.g. “The killings are not the whole story” or “There were murders, but no genocide”) are perfectly consistent with a story that documents no treatment which minorities other than the Armenians didn’t also suffer under Ottoman rule. Whether Turkey’s undecided will be persuaded by a German-state-backed, Hollywood-style flick is open to debate. Either way, it is difficult to argue that the millions invested into The Cut were the most efficient way of promoting awareness about the genocide. For that seems to be the main positive result one can hope for.